Recent advancement in science and technology has given rise to an emerging field of Regenerative Medicine. It is a broad definition for innovative medical therapies that enable the body to repair, replace, restore and regenerate damaged or diseased cells, tissues and organs. Scientists worldwide are engaged in research activities that may facilitate the repair of damaged heart muscles after a heart attack, replacement of skin for burn victims, restoration of movement after a spinal cord injury and the regeneration of pancreatic tissues to produce insulin for patients affected by diabetes. The main focus of Regenerative Medicine is to develop medical therapies for complex and life-threatening conditions. However, an important area of research- joint problems and conditions associated with it are being neglected.Unlike the skin, the bone and the cartilage has limited potential to heal itself. Unable to repair itself, the problem progresses to advanced stages of arthritis in many patients causing pain, stiffness and lack of mobility which indeed affects the quality of life. 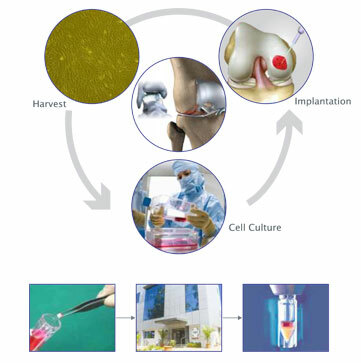 REGROW™ is the first and the only biotechnology company in India that offers Regenerative Medicine, specifically targeted for the orthopaedic segment in the healthcare market. This is because of a constant rise in the arthritis patient pool and new issues that have cropped up within a large section of the youth owing to lifestyle changes. 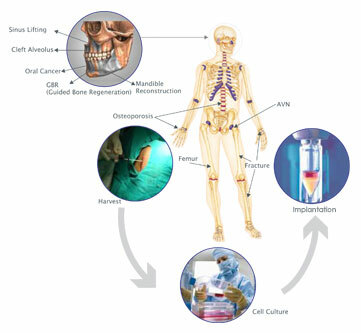 REGROW™ is focused on developing new therapeutics for age-related degenerative diseases of the joint, bone and cartilage. REGROW™ has taken cell therapies from a research and development stage, through manufacturing, to successful commercialization to reach patients today. REGROW™ offers patients specific advanced autologous cell therapies such as CARTIGROW™ and OSSGROW™ through its state of the art Cell Processing Centre [CPCTM] situated in Lonavala, Maharashtra. CARTIGROW™ is indicated for cartilage damage in the knee, ankle and shoulder joints caused due to trauma, injuries or disease condition. OSSGROW™ is indicated for avascular necrosis, non-union fracture, fibrous dysplasia, bone cyst/cavity and facial bone defects. Till date, more than 500 patients have benefited from the autologous cell therapies as offered by REGROW™. We are on our way to achieve the mission which would bring the medical marvel of Regenerative Medicine to patients and standardize its use in everyday medical care. REGROW™ is one among the very few Regenerative Medicine companies at a global level, and the only one in India.